Blink182's ' music video 'All The Small Things' is a parody of a number of pop music videos of the time most notably boy bands such as the Backstreet Boys,NSYNC and westlife but also other popular pop genre artists of the time such as Britney Spears and Christina Aguilera. The difference between a Parody and a Pastiche is a parody is a imitation that mocks. The band were well known for their humour and this is shown through this music video, while this video is a paraody the bands mocking style is critically acclaimed, with them winning several awards for the video, connoting that the parody was popular and liked at the time. 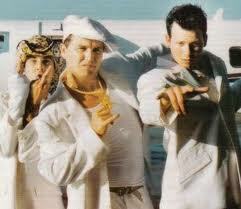 It also appealled to their audience as they are stereotypically opposed to the audience of boy bands. The whole mise en scene in this video is taken from various other artists and twisted into it being funny, through the bands winks and looks to the camera you can denote it's not meant to be taken seriously and also allows the audience to feel a a part of the joke. In these two pictues you can see the imitation through the costume used as Blink 182(Left) our wearing the same as Nsync(Right) was. This is just one example of the parody but it continues throughout the whole video. 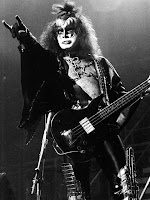 The key intertextual reference in this video is to the rock band Kiss, particularly with Robbie referencing the style of their lead artist Gene Simmons. This is achieved through mirroing different aspects for example their Dress code of sequins, lycra, black and white colour scheme and boots another way Robbie imitated them was by using their iconic face make-up style of white face with black lips and eyes he also copied the Hairstyle of being big and hairsprayed. Lead performance style and facial expressions also added to the references towards Kiss you can denote this through numerous close ups during the music video, a good example of this is the first shot used as it connotes our stereotypes of Kiss and instantly reminds us of them while subverting our ideas on Robbie this will broaded his fan base as he's branching out into other styles another example of his reference to them is the used of 'Flying V guitars' which was often was opted style used by Kiss. These references change the predicted audience of the video as it attracts male,masculine rock fans over the previous target audience of Robbie Williams which consisted prodominantly of teenage girls and young womenand other pop fans. Therefore, this music video broadens his image and identity from mainstream pop singer to someone who experiments with style and isn't just a tool of a major label. You can easily see the references between Robbie on the left and Gene Simmons on the right in these two photo's. Another obvious comparsion used which i didn't mention earlier is having the chest area showing which you can denote in both pictures. Cinematography : Throughout the video a lot of Close ups are used on the characters as this allows us to denote their feelings at the time, the first close up is during the shot reverse shot when our characters meet, it forshadows happiness as everyone is smiling however this idea is shown to be wrong later in the video through a number of flashbacks and song lyrics. During the video depending whos in the shot Gwen Stefani or the male actor are always between the power points of the screen and when both in the same shot they often share the centre of the screen together this connotes their importance while it always connotes the males partner is inferrior to Stepfani and her relationship towards the man. This is shown numerous times throughout for exmple at 0:45.0:56,2:2. In this video there is a variety of shots mostly consiting of close ups and long shots, overall the shot types used are basic but effective. Editing : At the begining it cuts between Gwen Stefani and a couple walking when Stefani opens the door a shot reverse shot is used to show the emotion between the trio. This technique(shot revser shot) has been used throughout the video a number of times each time denoting the feelings of the characters used in them it is often a shot reverse shot between Stefani and the male actor playing her Ex in the video, through these shots we connote that she still has feelings for him which contradicts the chorus of the song as she sings 'I know we're cool'. Another technique used throughout is flashbacks between the pair (Stepfani and the Man) this links to the lyrics as shes singing about history of what they ust to have and how they are now however through the flashbacks used it just conforms more to the contradiction of her Chorus to what were seeing as it shows them always having a good time together. There are a number of different settings used in this video for example at the starts two characters are walking on a large estate which then changes to the inside of a building and from there through numerous flashbacks takes us all the place for example at 0:57 they are infront of a river and at 1:02 they are in some feilds. The number of settings for this video is a real strength of it as it shows the pair (stefani and the male actor) have history which links in to the songs lyrics. As far as props go besides the interier of her house there isn't many which is a disapointment however because of the narrtive in the video being based around her and the man props aren't crucial unlike other videos. A number of costumes are used during the video as it shows time has moved on from each flashback and that its a different day. While the lyrics and video conform to Gwen Stefani's predominant genre of pop, which can be denoted through the visual images and colours used as they are all bold and bright connoting happiness and joy a basic stereotype of the pop genre. The actually lyrics when compared to the video however tend to subvert each other and cause a contrast effect reflecting real life slightly as sometimes we have to pretend were happy for other people's happiness. I think this point allows people to relate to the song and video which is a key selling point for any artist. Cinematography -In this video the shot types used are very basic. The composition of the shots are all based around Beyonce with the camera on her at all times this denotes her dominance in the video. Even though the cmaera shots used are basic the movement from the camera is very good and dosen't stay still for long periods of times often giving the illustion of the dancers moving when infact its the camera. It also used a number of Zoom,panning and tracking shots throughout the video giving you views from loads of angles but mostly with beyonce in between the power points, once again connoting her importance and dominance within the video. Editing -The whole video is shot in black and white, when changing shot type or shot angle in the video they often use a quick fade effect to make the video look smoother and avoid annoying jump shots which would ruin the visual imagery on screen, causing you to lose focus with beyonces performance. Mise en scene - In the video Beyonce and her backing dances wear black leotards throughout with black heels as their only costume which is unusual for a mainstream music video. During the video there is one main overhead light on them at all times with fades introduced when the shop angle is changed. The back drop to the video is white however at times its dark and has shadows depending on the rest of the lighting. While the Mise en scene in this video is basic its also effective in what it does as it draws your attention to the performance strickly and not the background which is a positive as its a performance video. It is mainly a dance video without many relationships between the lyrics and the actually video footage however when she sings "put a ring on it" she references her hand by pointing towards it connoting she means wedding ring. Another link between the video and the lyrics can be denoted when she runs to the other side of our screen when she sings 'And like a ghost our be gone' this action connotes that she won't wait around and will just move on symbolizing she's a strong modern female which she tries to show through her newer video's including this one. Cinematography - In this video a number of basic shot types are used predominantly consisting of Mid and Long shots allowing the audience to denote his isolation throughout the video. The video seems as its shot with omniscient narration throughout however we later find out that the protagonist is actually a stalker making the begining of the video restricted, when we find out he's an stalker it further connotes the idea of loneliness. The mid shot at 3:11 allows you to denote all the puppets he has made to give him a sense of friendship connoting loneliness once again. The song lyrics are amplified at times during the video for instance at 1:41 when he hangs a picture on the wall and the lyrics sing 'If things go right we can frame it and put it on a wall'. Mise en scene - In this video there are no noticeable costume changes by any of the characters. However there are a number of different locations used throughout this connotes loneliness as he's always by himself in very isolated areas for example the long corridoor at 0:18 or when he was sitting on the bench in a field at 1:02 writting by himself. Genre - Ed Sheeran is known for a number of different genres such as Folk rock, acoustic, Hip-Hop and Grime. However the song Lego House, the third single lifted from the debut studio album '+' is recognized as Folk and Soul. Cinematography - This is a performance video, you can denote this as the lead singer or other band members are shown throughout the video between the power points. The video also amplifies the lyrics at times for instance at 1:12 he sings ' The lights will guide you home' as he turns into a tunnel with light leading to the exit. Another instance of this is when the tempo speeds up and he starts to run connoting energy and excitement. Editing - During the video it appears that the footage has been slowed down at numerous points for example the beinging of the video denotes this. Mise en Scene - A number of locations are used in this video across London including the arena. As the majority of them are avaerage streets in London it connects them to their audience as people can draw similarties with them connoting them to be down to earth people. Also the costuming for this video is basic as they don't change clothing once this also connotes them being down to earth people. Genre - ColdPlay are an alternative rock band from Britain, the Song 'Fix you' is of the alternative rock and Post-BritPop genre an Sub-genre to alternative rock. It reached number four in the UK's singles chart and was played live at the Steve Jobs memorial/celebration-of-life event 2011. Target Audience -﻿ ColdPlays originally primary audience was of 12-17 year olds however when researching i found this surprising and noticed that it has changed since they started. They now have a much wider audience range of 15-40 as over the years their original fans who grew up with them and have aged leading to an explantion in audience as younger listeners have become part of it. Use of conventions : This is a performance video because she is the only person to feature in the video, through the mise en scene it also amplifies the lyrics of the song for example being in a bird cage and singing about a bird. Technical aspects : The cinematography and edited on this video are very good. There are numerous shot types throughout the video for example she starts the video on a high angle zooming in another shot type used often in this video is a panning shot across the artist allowing you to denote her feelings. The close up on the guitar showing the strings vibrate is also a very good innovative shot as its unusual and adds another dimension to the video then typical basic shots. For edit the slow motion used when the feathers are blown past her is very effective. Mise en scene : This video has a really good mise en scene section with the props and location for instance she uses a bird cage as shes singing about a bird and also has feathers blown past her once again linking to the song lyrics. Her costume for this video is a white dress connoting purity and innocence which subverts the lyrics as shes singing about injuring a bird because of what it might sing about. Star persona : Through her costume she is portrayed as innocent as she's wearing a white dress which connotes purity and innocence. You can also denote innocence from the first shot as we see her spinning on the swing connoting she's innocent as this is what we associate with children. These ideas are backed up through the lyrics at first as she sings 'a bird flew by so i set up a nest outside' this connotes she's caring and affectionate, however these ideas are subverted later in the song when she sings 'Trapped him under a carboard box stood on him to make him stop' this subverts are originally ideas about her and connotes that she actually not innocent. For location she is in a cage which connotes she locked up whichi connotes danger. Through the whole video we see her in two different lights so its hard to decide on one. Use of conventions : A convention used in this video is the band being in shots throughout the video making it a performance video. Another convention used is the use of women in the video connoting a love interest which links them into the songs lyrics, on top of this is the amount their used as they normally feature between the power points connoting their importance in the video which is also a convention. Technical aspects : During this video they use a mixture of IStop Motion and basic but effective camera shots to create meaning and convey emotion, the most typically used in this video is a close up shot. At points Istop Motion and the camera shots used on the band come together for example the close on the the guitarist playing next to the dresser top has numerous items move across towards him, this works well because it looks as hes still playing the guitar normally. What helps this video is the actual performance by the lead singer as it looks realistic and keeps us more focused on the video then we would'ave been. Mise en scene : One limitation of this video is its all shot in the same room however they have used the room very well, for example the props in the room change serveral times along with the wallpaper giving you a feel of a changed location. 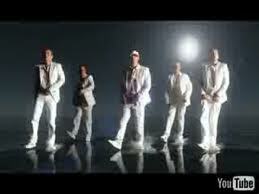 They also change their clothing in the video as they change the room walls from black to white, their clothing changes in a similar sense from dark coloured casual wear to light coloured polo's and shirts representing a change in attitude backed up by the tempo speeding up connoting energy and joy. Through the song lyrics and music video itself it promotes them as a lively stereotypical group of young teenage boys who like to have fun you can denote this through the close ups on the beer cans and also the lyrics 'Remember when all the bars were electric'. I would say there predominant fan base would be teenage and young women with a smaller secondary audience of young men this is because through the video and lyrics they would be able to identify with them as this is what they do or recently did for the aging adult taking them back to enjoyable memories which would help sell the artist. Technical aspects : Throughout the music video they use IStopMotion, i like this because its unusual and adds something different to the video as it allows you to be more creative for example without it they wouldn't of been able to do the Egg scene. However the cinematography used during the video on the band i thought was a little boring as it was mostly close ups or long shots and got repetitive, they also didn't look as if they was actually singing so that aided to ruining the shots. mise en scene : I thought the props used in this video was the strongest part of their mise en scene, a good example of this is the metal biscuit cutter used when frying the egg as it was in the shape of a heart denoting love which amplifies the lyrics to the visual images. Another aspect i liked was the locations used because it made it more interesting then being in the same place for a whole video. A let down for the video however was the costume used as it was bland and didn't add to the video. Star persona : From the representation of this video i would call them a young band with a predominant target audience of teenage girls you can denote this when he's walking around shirtless connoting hes comfatable with his body and also conforming to the stereotype of young pop/rock groups. Throughout the video he is also shown as a sweet hearted boy from the song lryics but also on screen images for example he brings a girl breakfast in bed connoting he's a nice person and knows how to treat a lady which will broaden his fan base another exaple of this is when he sings ' If i only knew your name i'd go from door to door' connoting he's ready to treck the streets non-stop for his love.